Chalk Talk: A Kindergarten Blog: Autographed Pete the Cat Giveaway!! A few weeks ago my day was made when I received an email from Eric Litwin!! 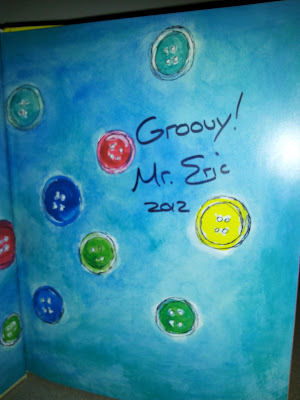 I asked him if he would autograph a copy of his BRAND NEW BOOK Pete the Cat and His Four Groovy Buttons for me to give away to one of my followers. He said "Yes"!! All you have to do to enter is 1) follow Chalk Talk 2) Add Chalk Talk to your blog roll 3) Follow Chalk Talk on Facebook here or here and 4) Leave a comment with your name and email address in it. You can leave a separate comment for each requirement. The giveaway ends Sunday May 13th at midnight. Good luck! I like Chalk Talk on Facebook. I'd love to win! I love Pete the Cat! You are on our blog roll! I dont have a blog or blog roll but if I did you would be on it! I follow your fab blog!!!! Your liked by me on Facebook. I follow your blog. I love me some Pete. So excited to see you on Facebook too. I now follow. I am a follower of your blog and I love it!!!! I hope I win!! I love Pete!!! I am so in love with "Pete the Cat!" I have been a follower of your blog! Love it!and I love Pete the Cat! I am giving my students as an end of the year gift, a copy of the first book as it is a wonderful life lesson! I love Pete and your blog! I'm following! Loooove Pete! I follow your blog! I love Pete the Cat!! I follow your blog! My kindergarten kids love Pete the cat. I am so looking forward to seeing the new Pete the cat book. When I first introduced him - my kids sang his song for days and weeks. Thanks for hosting such a nice giveaway. Someone is going to be thrilled when they win this new book. I also follow you on facebook. Thanks for the chance to win one of the Pete books. I follow Chalk Talk on FB too! I follow your network blog now. I now follow Chalk Talk on FB! Oh my! I just bought this book two days ago! We read it like...100 times yesterday! My kids were hooked! You are definitely on my blogroll! What a great giveaway! Here is my info! Yay! Pete the Cat! How awesome!! This is great! I am dressed as Pete the Cat right now for favorite character dress up day! I follow and enjoy your blog. I follow your blog! It is my favorite! I saw a previous Pete the Cat post of yours and bought a copy of I Love my White Shoes the next day. My boys LOVE this book! We read it at least 50 a day! I love your blog as much as my students love Pete the Cat! Can't wait to use your more of your ideas when I switch to teach kinder next year. I'm SO excited!! I follow your blog! Thanks!!! How fun is this! I follow your blog. I have high hopes because I won your last author give away! I follow your blog! I have you on my VIP blog roll! I follow your blog. 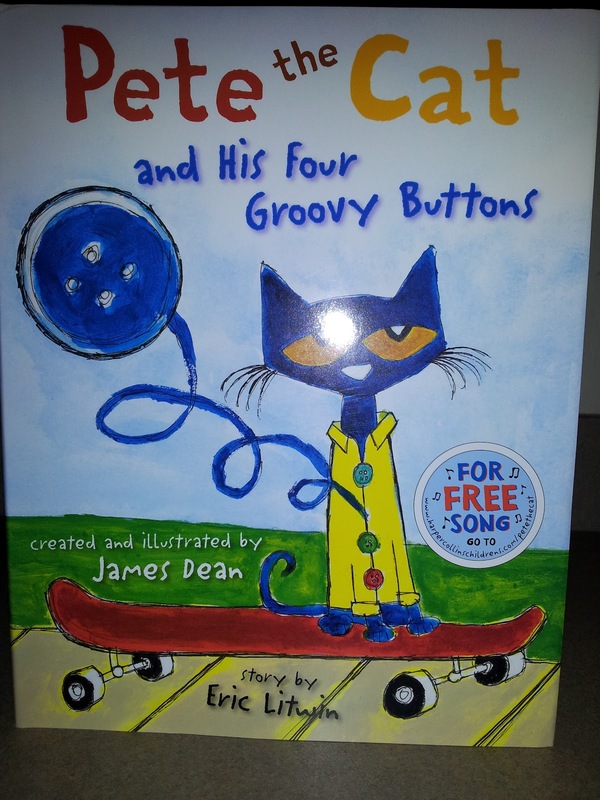 We just found Pete the Cat adn my 5yr old at home loves singing along to the video and sings the book. We just did cause and effect and writing with the first book in my Kinders class. Most of their Petes stepped in things along the road but one of my boys made the cutest picture of a giant pile of eggs and a tiny Pete on top. They are excited there is a new book. I follow your blog. What anI awesome give-a-way. I am a Chalk Talk Blog follower. Love Pete the Cat! I follow your blog. Love Pete the Cat! Did all 4! I follow you!! I LOVE Pete the Cat!! I'm following your blog, liked you on facebook and pinterest, and I added you on my blogroll!! I love Pete the Cat and am hoping to win the newest book! Hi there, I Love Pete the Cat. I follow and "like" you and your blog. My sister Andi (comment way above: Pencils, Glue & Tying Shoes) has you on her blog roll (she blogs, I fb) What an awesome give away!! Thanks! I added your blog button to my blog garden. I follow your on network blogs and liked your facebook page. I liked Chalk Talk on Facebook! My Kindergarteners LOVE Pete the Cat!! I love your blog and I love Pete the Cat! I follow your blog and my students LOVE Pete the cat!! Love your blog and Pete the Cat!! I love the ideas you share on your blog and my class LOVES Pete the Cat! I follow you on facebook. Love Pete the cat! I love your blog! Its on my favorites! Just found your blog. LOVE Pete the Cat! I follow you and your on my blog roll.